There is no such day when the designers get spare time because the entire organization is on their shoulders, they run the show, they do campaigning, and they do all the design work of the firm to get them approved by the authorities and clients. Well what a busy day they have, that it becomes even harder to live up to the expectations. But it is such a child’s play for a designer to outdo himself once he has got the talent in his bones, ideas in his brain and tools to use. Whether it is about designing a template, or a simple layout, a logo design or a business card, he does it all well that nobody can ever assume what genre he is good at when he looks like jack of all trades. 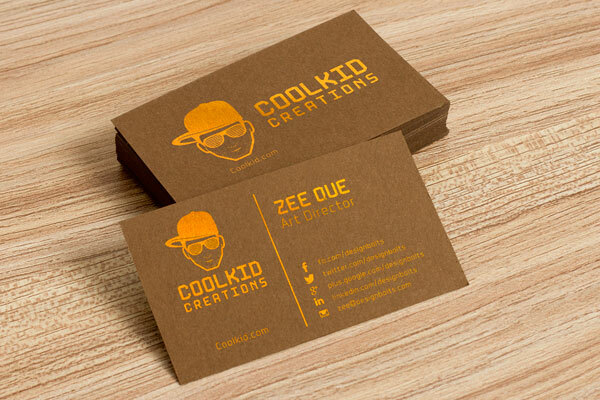 Here I have free brown business card design template & mockup PSD that I made to accommodate all those designers who are currently having to deliver a business card to the client. Now insert your business card design into this mockup and use it freely as a mode of presentation. Because in this way through a mockup, the client will have a pretty pleasant idea that how his business card is going to look. It is basically foil printed card that is why it looks attractive and eye catchy. Learn to use your versatility on your work place and be different in your skill because that is what will make you notable. Well for more freebies and useful design posts, don’t forget to check back every day because we have plenty of stunning posts to accommodate you. For the beginners and learners, it is very important to look up to the work of inspiration. Even after years and years of work I still seek refuge in the inspiring art pieces of the professionals and experts because that makes me know where do I stand, what more I have to learn, how my skill can be improved and how ideas have to be implemented. Scroll down and take a look at the business card template and mockup that I designed lately. Subscribe us for more!